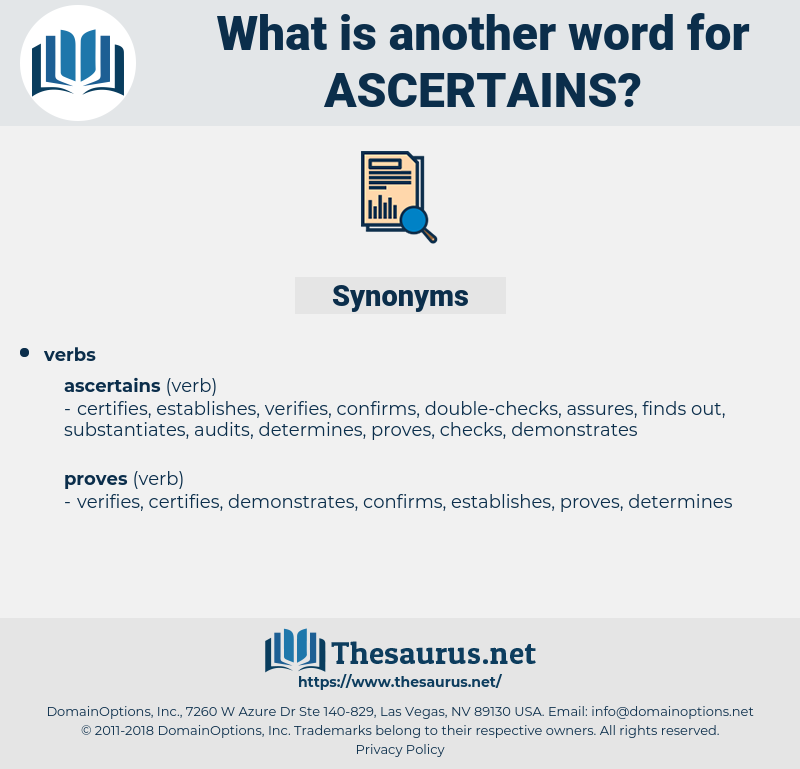 What is another word for ascertains? 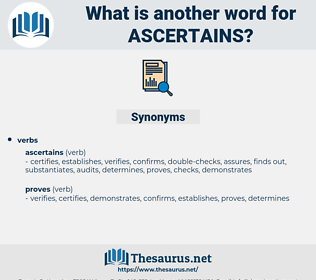 substantiates, verified, verifies, delineates, Guarantees, insures, realises, pinpoints, articulates, estimates, validates, calculates, guaranties, transpires, classifies, detects, checks, entrenches, arranges, certifies, realizes, enacts, dictates, enforces, reveals, prescribes, supervises, reviews, compiles, enshrines, introduces, perceives, formulates, stipulates, Tracks, computes, oversees, audits, proves, reckons, outlines, fixes, conducts, aileges, finds, Strikes, contends, edits, underwrites, shapes, governs, elaborates, forges, produces, ensues, sees, bestows, draws, engages, Deems, lays, develops, believes, feels, appears, performs, affords, sets. investigates, assesses, confirms, evaluates, inspects, discovers, assures, examines, reassesses, monitors, understands, ensures, considers, Tests, secures, concludes, satisfies, creates, prepares, provides, builds, evidences, notes, makes. accreditation, accordion, ageratum, accretion, assertion, au gratin, ageratina.